1. For the dressing, roughly crush the cherries in a large bowl with a fork (or use a pestle and mortar). Stir through the olive oil, balsamic vinegar, orange zest and orange juice; season. 2. 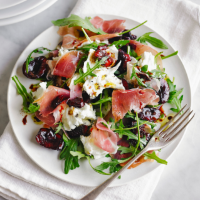 Arrange the ham, mozzarella and rocket leaves on plates (or a large platter), then drizzle over the cherry dressing before serving. This recipe was first published in Mon Jun 01 14:53:00 BST 2015.